Here you can find LineageOS 14.1 ports for LG G Pad 8 tablet (v480 and v490 models). Read below to get download links and install instructions to easily flash your device. 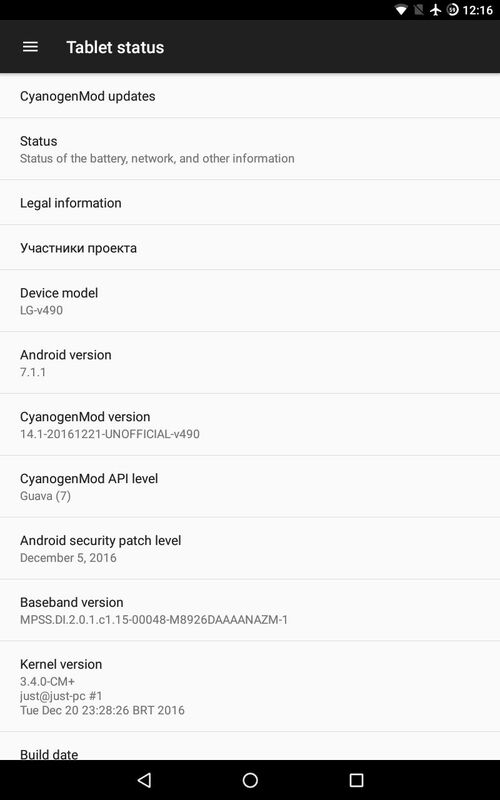 Old CM 12.1 files for v480 can still be downloaded from the same links as published before. v400 user? Check just.pro.br/download/android/v400 for new unofficial builds. If you already have CM 12.1 installed (v480 only), remember to wipe your data via TWRP Recovery before flashing LineageOS 14.1. Also, don’t forget to update GApps package. Everything is working fine for v480 model. If you find any bug, contact me using Google+, Twitter or Facebook (links at the bottom of this page). What is working for v490? DISCLAIMER: Modifying or replacing your device’s software may void your device’s warranty, lead to data loss, hair loss, financial loss, privacy loss, security breaches, or other damage, and therefore must be done entirely at your own risk. I will NOT be responsible for your actions. Good luck. WARNING: Your device MUST be running stock KitKat. If it is running Lollipop, your bootloader is locked. You must downgrade before proceed. If your device is already running stock KitKat, you can skip this section. 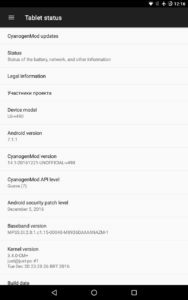 1) Download LG drivers, LG Tools 2014 and stock KitKat ROM (v480 or v490, choose your device model). Extract LG drivers and LG Tools 2014 to a directory of your choice. 2) Turn off your tablet. Hold volume up and plug the tablet in your PC USB port. Keep holding volume up until you see the firmware update screen. 3) Run LgFlashTool2014.exe, it will be among the extracted files. 4) In the LG Flash Tool 2014 main screen, don’t touch any option. Click the folder icon and select the KDZ file you downloaded (the stock KitKat ROM). 6) In the next window, click START. 7) Now, select your country and language (actually, the only option for country is Korea. Select “Other country” if you are not korean :p). 8) Another screen will show up with a progress bar. A warning message telling you that it could not get the update from the Internet will be displayed. Don’t worry, just close it and wait for the process to finish. You will see a progress bar on your tablet screen. After it have finished flashing, the device will reboot automatically. Now we have got to the good part! Follow the instructions below and you won’t be disappointed. 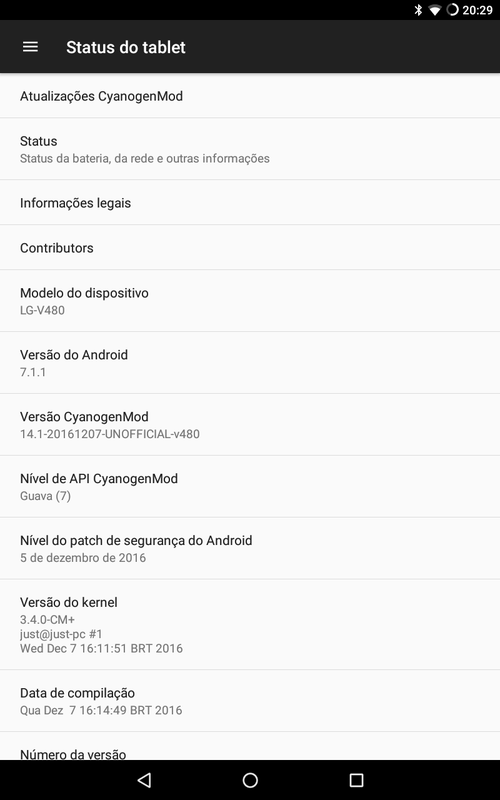 If you want, you can still download the last CyanogenMod 12.1 build for v480: cm-12.1-20161120-UNOFFICIAL-v480.zip (MD5 sum). 2) Download your preferred Google Apps package. I like to use The Open GApps Project. Also, place it in your device’s sdcard. 3) Download King Root and Flashify from Play Store. 4) Run King Root and tap to root your device. It will need an Internet connection. 5) Run Flashify. Give it root permissions, tap to flash Recovery image and select the recovery image you downloaded. Confirm flashing. After flashing, Flashify will ask if you want to reboot recovery. Just do it. 6) Once in TWRP recovery, tap Wipe and wipe all your data. It will erase everything, so, better you have a backup of your personal data (unless you are a cloud addicted 😉 ). 7) After wiping, go back to the home screen and tap Install. Select the LineageOS ZIP file you have downloaded (if you can’t see it in the list, check if you are in the correct storage device by tapping the Storage: button on the top of the screen). 8) Swipe to confirm and wait. 9) After installing the ZIP file, you can install Google Apps package too, just use the same method. LineageOS doesn’t have root by default, but you can easily root your device. Just download the official root package from download.lineageos.org/extras and install it via TWRP. For v4xx tablets, choose the ARM version. If you need help, feel free to contact me on Twitter, Facebook or Google+. Also, if you find something wrong (like a bug), don’t hesitate to tell me.